XenApp 6.5 brings with it exciting new features such as a brand new management console, Instant App access, Multi-stream ICA, Single Sign-on and SmartAuditor enhancements, and more. 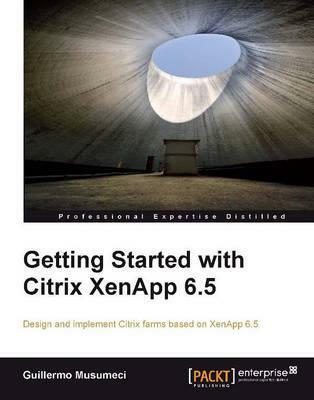 Getting Started with Citrix XenApp 6.5 provides comprehensive details on how to design, implement, and maintain Citrix farms based on XenApp 6.5. Additionally, you will learn to use management tools and scripts for daily tasks such as managing servers, published resources, printers, and connections. Getting Started with Citrix XenApp 6.5 starts by introducing the basics and new features of the brand new version such as installing servers and configuring components, and then teaches you how to publish applications and resources on the client device before moving on to configuring content redirection. Author Guillermo Musumeci includes a use case throughout the book to explain advanced topics like creating management scripts and deploying and optimizing XenApp for Citrix XenServer, VMware ESX, and Microsoft Hyper-V virtual machines. It will guide you through an unattended installation of XenApp and components on physical servers. By the end of this book you will have enough knowledge to successfully design and manage your own XenApp 6.5 Farms. Unattended installation of XenApp 6.5 on physical servers. This book has a tutorial style with step-by-step instructions and adequate screenshots for carrying out each task. If you are a system administrator or consultant who wants to implement and administer Citrix XenApp 6.5 farms, then this book is for you. This book will help both new and experienced XenApp professionals to deliver virtualized applications.